BusOnlineTicket.com is so happy to share a great news to everyone living in the west region of Singapore! 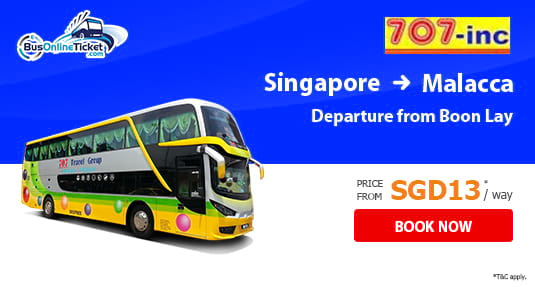 Apart from boarding the bus from Ban San Street or Queen Street, 707-Inc is offering a new departure point in the west region of Singapore for bus service from Singapore to Malacca. The newly added departure point for bus from Singapore to Malacca is located at Boon Lay Shopping Centre. Boon Lay Shopping Centre is located near to the Lakeside MRT Station. In Boon Lay Shopping Centre, there are many retail shops and eating outlets. Hence, passengers can have a quick meal before departure. The bus departing from Boon Lay Shopping Centre will drop off the passengers either at Melaka Sentral Bus Terminal, Dataran Pahlawan Melaka Megamall, Mahkota Medical Centre or certain hotels in Malacca. The ticket price for bus from Singapore to Malacca is reasonably charged as low as SGD 13.00 per way. Bus services between Singapore and Malacca are important especially for the working adults and students who travel back and forth from their hometown on weekends. Passengers are advised to book their bus ticket online in advance during holidays and peak seasons via BusOnlineTicket.com. Confirmation of tickets is instant in BusOnlineTicket.com.